My family and I LOVE Texas Chili. It’s savory and spicy and meaty. And it’s one of those few mysterious meals that may actually taste better the second day. Texas Chili is also very simple. Once you are done throwing everything into a big pot, it simmers for hours. This leaves you time to get things done, while you salivate over the tantalizing aroma that fills your home. I made Texas Chili this past Memorial Day weekend and took it camping to Cooks Forest, PA. All nine hungry campers (minus one sweet little baby) finished a big batch that I warmed over the campfire. It was the perfect rustic, yet tasty meal. Texas Chili can be as spicy as you wish, depending on the amount of crushed red pepper; so be sure to taste accordingly, especially if there are little people expected. I like to serve it topped with shredded cheddar, chopped avocado and a dollop of sour cream. I also like to ladle the chili over some good white rice. Try it, you won’t be disappointed! 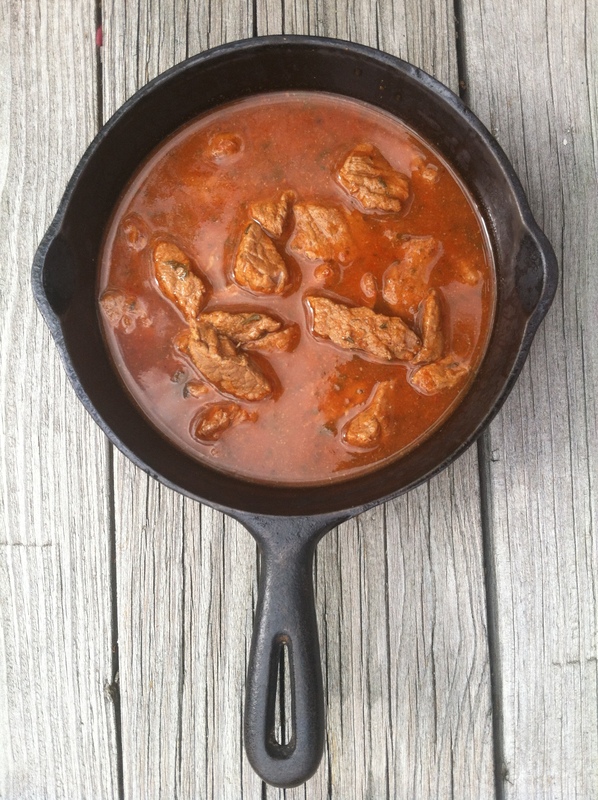 Cook and stir half of the beef at a time in oil in Dutch oven or heave sauce pan over medium heat until light brown. Drain. Stir in parsley, water, seasonings, garlic, onion, and tomato sauce. Heat to boiling and reduce heat. Cover and simmer 1 hour, stirring occasionally. Uncover and simmer, stirring occasionally, until mixture thickens, about 1 1/2 hours longer. Remove bay leaf. Serve over cooked white rice if desired. Tags: beef dinner, camping meal, chili, rustic dinner, texas chili. Bookmark the permalink. High praise from a true Texan:-) Thanks!